We often forget just how primitive the web used to be. Dating back to the late 90s and early 2000s people were just getting online, and even then many didn’t use the web very often. Nowadays most people can’t imagine life without the Internet. And because of that growing audience, web design has seen many advancements for the better. 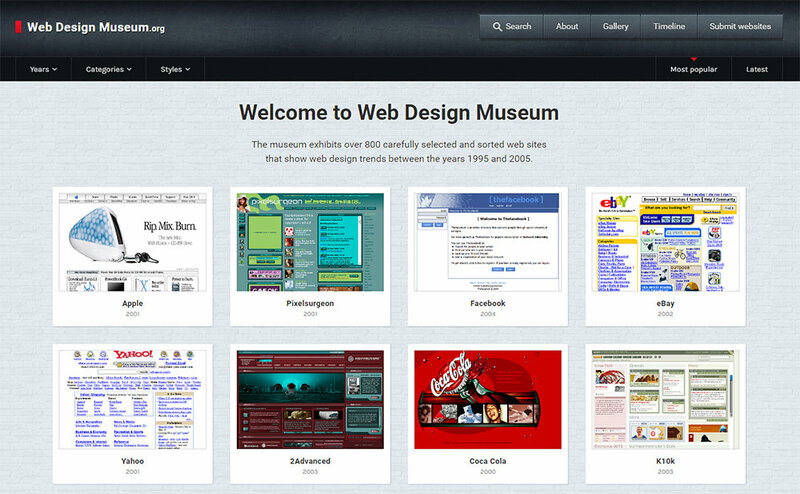 The Web Design Museum is an online archive of screenshots from older sites dating back through 1995-2005+. This was the first major decade of the consumer web and it’s fun to see how many sites followed these now-outdated trends. For browsing the museum you have a few options. You can do a search to find a specific site(s) you’re looking for. This is a fun way to check out different years and changes in designs for your favorite sites like eBay or Google. But there’s also a really cool timeline page listing a full timeline for each website in the gallery. This way you can dig into the site’s design for every major year available. Not every company dates back to the 90s, although many examples like Coca-Cola will leave you red with embarrassment. The Web Design Museum gallery lists over 800 websites with different screenshots dating back to the mid-90s and various redesigns along the way into our present era. It works much like the Wayback Machine except these screens are just images, not fully archived pages. These screens also feature all the proper CSS/images required to view the sites in fulls — something you won’t find in the Internet Archive’s database for every screenshot. This site probably won’t make you a better designer or help you design faster. But it will give you a taste of the older web so you can see just how far the web has come in a few decades. To learn more visit the about page and be sure to dig into their massive gallery. And if you have screenshots from classic websites you can even submit those into the museum to be archived for future generations. The post This Website Shows You Web Design Trends From The Past appeared first on Hongkiat.